As I walked around the grocery store today for hamburger buns, I passed a bin of flip flops. I realized that I chose my flip flops because I thought they were cute. Except…..no one can see the cute pattern when I’m wearing them because my foot is covering it. I want flip flops that 1) people can see as cute and different and 2) are identifiable as MINE from the pile of 20 shoes heaped by the door. Yes, I am bitter about people taking my shoes “because they fit me and I couldn’t find mine.” Last year, my daughter and I wrote our initials on the sole, near the strap (the vertical surface) as a way to keep our flip flops identifiable from the other people we shared a bunk room with. Because we were on a mission trip, cuteness was not a consideration. Taking inspiration from 320 * Sycamore, my youngest and I created flip flop cuteness in about five minutes. Lay your fabric out and trace a circle. My circle was 8″ across. Cut out the circles. I was able to cut both circles at once. 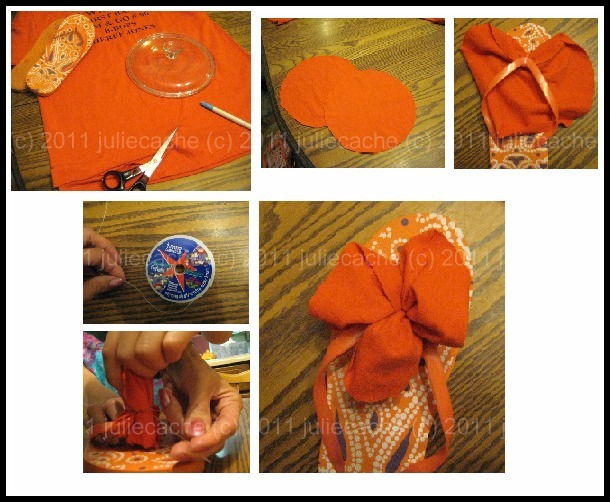 Arrange the fabric under the flip flop into equal thirds. Cut a length of stretchy cord, or regular string. (I had my helper hold the fabric while) I tied the cord. Arrange the fabric into even looking poufs. Repeat for the other flip flop and adjust for symmetry. This is post is part of Making Monday Marvelous. This entry was posted in crafting and tagged flip flops. Bookmark the permalink.